2002 Le Tissage aux Cartons dans l'Egypte Ancienne, translation serialized in Twist. 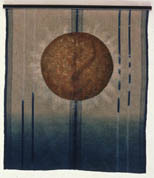 2000 "Healing Cloth," Indigo Bridging Cultures, Textile Arts Center and Ukranian Institute of Modern Art. In the Mantles and Scrolls series I further explore man's need to visualize his understanding of order in the universe. Through the centuries we have catalogued this search through images and text. The physical qualities of cloth are a part of my personal exploration. The sensuality of silk and velvet combined with their depth of color add a sacred quality to my work. Color and pattern are a language as evocative as script and in the search for understanding the cloth itself becomes hallowed. My baskets are made of coiled waxed linen on a coated wire core. I paint all the linen thread before I start the coiling process with the general shape of the basket and embellishments in mind. I am influenced by the very rich traditions of both Native American and African coiled baskets. While striving to create something personal and richly evocative, I explore traditional techniques with new materials. I have found that a restricted color palette has been one of the most stimulating aspects of this new exploration.